A favorite Key Hall wedding photo is this stolen moment with Sarah and JP with the bride and groom on stage in Proctor’s theater. 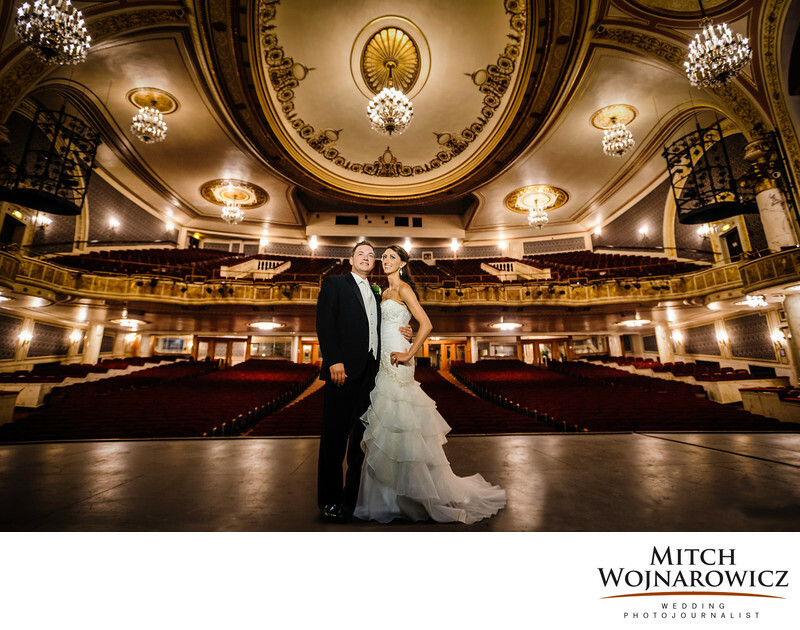 As a Schenectady wedding photographer, I’m always happy when we can get into the historic Proctors theater for a few minutes for a photo. In this case, we stole away during their reception for about 15 minutes. It’s a favorite thing to do, leaving the reception for just a few minutes. It gives any bride and groom a couple of seconds to catch their breath and to focus on each other. We usually spend about 15 minutes doing some relaxed wedding portraits. Then the couple is ready to head back to their Schenectady wedding reception with renewed vigor, ready to party the night away. Hiring an inexperienced wedding photographer or a budget wedding photographer may save a few dollars. In the end an experienced wedding photographer has the vision and the skill set to produce wedding photos from Key Hall such as this one which takes technical skill, the proper equipment and an experienced photographer to pull it all together...The reception and you guests shouldn't have to wait. You don't a long time away from your reception taking photos. And certainly the security people in a location such as this won't wait for a long time for you to take your photos. Keywords: Key Hall At Proctors (3), schenectady (12).